I was thrilled to see that my favorite online cooking show, Cooking with Dog, uploaded a new video! Not only was it exciting because the chef had been in a very serious accident and was in the hospital for quiet some time, and a new video meant she was back and well! But it was also exactly what I had been looking for!!! Mochi! Since trying my first mochi at Happy Sumo, making it at home has been on top of my cooking to do list. Only problem was, I didn’t know how to do it. I can’t wait to give it a try! Here is the video, give it a watch, even if you aren’t planning to make mochi. It’s a pretty cute video, the “French” poodle makes me giggle every time. 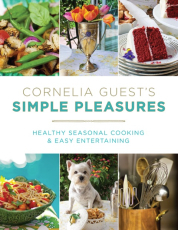 I was excited to get a copy of Cornelia Guest’s Simple Pleasures: Healthy Seasonal Cooking and Easy Entertaining for review, not only because I love recipe books, but also because there was an adorable dog on the cover. The author is an avid animal lover, and each and every recipe is vegan! What a lovely surprise. The book is gorgeous, with ideas for entertaining in addition to recipes. There are also tips to show you how to incorporate affordable, cruelty-free eating into your daily life and to serve that luscious, wholesome food to friends. Organized by season, each part begins with a terrific meal — a light spring lunch of chilled asparagus soup and quinoa salad; an alfresco summer dinner of veggie carpaccio and stuffed squash blossoms; a fall breakfast buffet of pecan waffles, faux buttermilk pancakes, and raspberry muffins; and a cozy winter’s dinner of shepherd’s pie with a chocolate tart for dessert. Each seasonal section contains recipes for beverages, soups, salads, pastas, side dishes, main courses, and an abundance of desserts that everyone will love. Special sections feature recipes for grains, greens, and beans. In “Notes from My Friends,” which appear throughout the opening chapters, chefs, doctors, Cornelia’s favorite veterinarian, and other health and food experts have contributed tips, advice, and eye-opening information. The images are colorful and inspiring, which is just what I love when looking at recipes. I can’t wait to try some of the recipes to surprise friends, especially when they find out the food is vegan! Zucchini blossoms are so beautiful. This is so easy to make, and your friends will be very impressed. You can make the stuffing the day before so you can enjoy your friends, stuff the blossoms and have a great lunch. Amaranth is a gooey grain that works well as a stuffing. 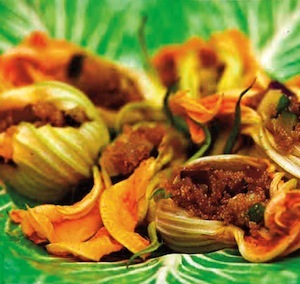 I serve this dish with iced tea with mint or a crisp white wine. Fresh tomatoes go well with the squash blossoms. The above is an excerpt from the book Cornelia Guest’s Simple Pleasures: Healthy Seasonal Cooking and Easy Entertaining by Cornelia Guest. The above excerpt is a digitally scanned reproduction of text from print. Although this excerpt has been proofread, occasional errors may appear due to the scanning process. Please refer to the finished book for accuracy. Cornelia Guest, author of Cornelia Guest’s Simple Pleasures: Healthy Seasonal Cooking and Easy Entertaining, is an activist, philanthropist, and businesswoman. In 2009, she founded Cornelia Guest Events and Cornelia Guest Cookies, catering charity and entertainment events with healthy, delicious vegan food. She is launching her own line of animal-friendly handbags, wallets, and dog accessories made with a vegan alternative to leather. She lives in New York. For more information please visit http://www.corneliaguest.com, and follow the author on Facebook and Twitter. Whenever I get a new cookbook the first thing I do is flip to the back where the dessert recipes are. I love baking desserts the most of all, and I tend to measure how good a cookbook is based on what the dessert section looks like. Taste of Home: Cooking School Cookbook: 400 + Simple to Spectacular Recipes did not disappoint! Now that summer is here, the Lemonade Icebox Pie is on the very top of my “to try list”! 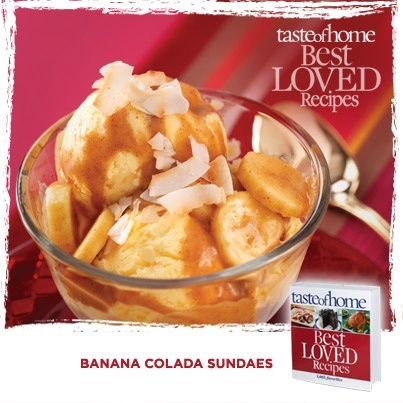 With over 400 recipes, ranging from simple to fancy, there is something for everyone. I love that it is packed with full color photos of the finished recipe (a must in my opinion), in addition to great instruction and helpful hints for how to cook. Taste of Home: Cooking School Cookbook: 400 + Simple to Spectacular Recipes is a great book for all levels of cooks, and even includes “Cheat It” recipes which require very little effort for big taste. This would be a fun gift for anyone who wants to improve their skills in the kitchen, or anyone who just wants some fresh new recipes to try. There are a lot of fun new takes on old standbys like hamburgers and pizzas, and even Chinese “take out”! It has been a new favorite in our kitchen since it arrived.